Photo taken on Oct. 14, 2010, shows the picture of Dr. Henry Norman Bethune at the Canadian Science and Engineering Hall of Fame in Ottawa, Canada. 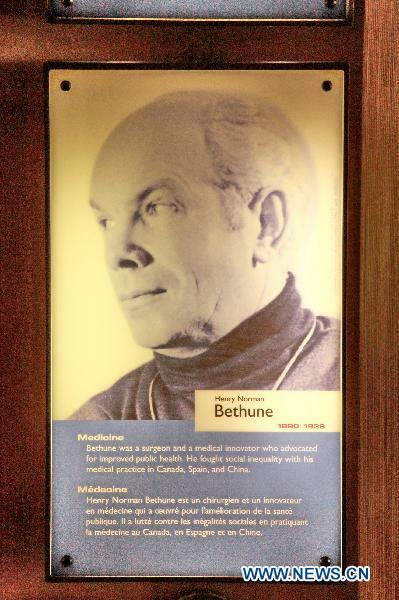 Dr. Henry Norman Bethune (1890-1939), a Canadian surgeon known for his selflessness and internationalism and for fighting inequality, has been inducted into the Canadian Science and Engineering Hall of Fame on Thursday. (Xinhua/Zhang Dacheng)Dr. Henry Norman Bethune (1890-1939), a Canadian surgeon known for his selflessness and internationalism and for fighting inequality, has been inducted into the Canadian Science and Engineering Hall of Fame. At a reception Thursday at the Canada Science and Technology Museum, the largest in Canada, its President and CEO Denise Amyot announced Bethune's induction, which honors individuals whose outstanding scientific or technological achievements have had long-term implications for Canadians. There are currently 48 Canadian scientists, engineers and innovators recognized in the Hall of Fame, of whose achievements the Museum hopes one day all Canadians will be aware. Bethune, who died of blood poisoning at the age of 49 on Nov. 12, 1939 in China while assisting the Chinese people against Japanese aggression, was also known for his innovative spirit in the surgical theatre and his instinctive ability to develop new instruments. From 1929 to 1936, Bethune perfected his skills in thoracic surgery and invented or improved more than a dozen new surgical tools. His most famous instrument was the Bethune Rib Shears, which remains in use today. Amyot said Dr. Bethune's legacy is one of selflessness on the battlefield but also one of ingenuity and innovation. In line with the celebration of the 40th anniversary of Canada-China diplomatic relations, she said both countries had a shared heritage and common potential as far as Bethune is concerned. The Chinese Ambassador to Canada, Lan Lijun, also delivered a speech at the function, saying Dr. Bethune was a good friend of the people of China, an internationalist and a great Canadian hero who had a noble heart. He was a symbol of friendship between Canada and China. Encouraged by his profound spirit of internationalism and humanism, Lan said, the Chinese people hope to join the people of Canada in facing the problems and challenges of today, and together strive to create a better and more peaceful world.